At the center of a perfect storm of boomer burnout, a brutal recession, and a rapidly changing industry, the mobile home retail market could be the worst industry in America. Here's why. If I asked you to name America's least fortunate industry, your mind might go to records stores, obliterated by on-demand apps; or photofinishers, left in the cold as digital cameras turn Americans into our own photo editors; or fabric makers, where business is booming ... in Shenzhen, China. But when it comes to unlucky industries, it's manufactured home (aka mobile home) retailers who really hit the trifecta*. First they missed out on the housing boom. Then they felt the gut-punch of the recession. Now they might yet might miss out on the recovery. That makes them America's fastest dying industry, according to a new report from IBISWorld. 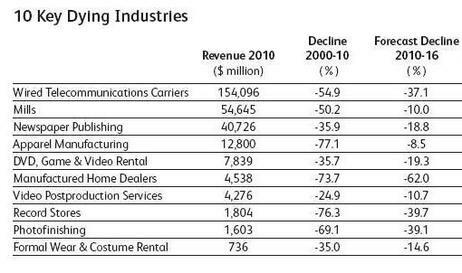 With a 70+% decline in revenue over the last ten years, the mobile home industry faced a descent on par with record stores and clothing mills. But it's the pace of its future decline that sets them apart. In the next six years, manufactured home dealers are projected to see revenue evaporate 50% faster than even music stores and the wired phone industry. Here are full IBISWorld rankings, listed by industry revenue. The typical mobile home buyer is a retiring, low-income couple in the southeast, said Mary Gotaas, an analyst at IBISWorld. The southeast region accounts for 40% of the industry's dealership, and mobile homes are usually bought by consumers over the age of 50. "They're retiring, they don't care about equity or link-to-land ownership, and they want something cheap because they're saving for things like medical bills," she said. "Thirty years ago, I had a list of 90 manufactured homes makers," said Thomas Roberts, a real estate agent with Century 21 Realty in Fremont, California, who works with mobile home makers. "Today, I don't think there are more than 25. Nobody's opening mobile home parks." Five broad factors account for the mobile home industry's long slide. First, the housing bubble's loose credit encouraged low-income families to buy regular "site built" homes instead of mobile homes. Second, the recession hit low-income folks who comprise most of the mobile home market harder than average. Third, the housing bubble's collapse killed the price of houses and condos, making them a better deal for low-income families (especially since manufactured homes depreciate in value, while a house's value increases over time). Fourth, older couples who would normally sell their house to buy a mobile home are waiting for the value of their houses to rebound. When the market recovers, they're more likely to buy "modular homes," which differ from mobile homes because their walls are put together on site. Fifth, and most importantly, even when demand for mobile homes returns, retailers might be left in the dust. A new trend in mobile homes is for manufacturers to open their own outlets, so that retailers are bypassed. "I actually think the next six years are going to shape up for [mobile homes] really well," said Thayer Long at the Manufactured Housing Institute. "People are looking for smaller homes, and dollar-for-dollar, we offer the best house." The future of the industry will resemble Clayton Homes, a mobile home conglomerate which was acquired by Warren Buffet in 2003. Clayton started as a retailer, but they've expanding into manufacturing, financing, leasing, and insuring mobile homes. Now the company is a do-it-all industry leader that even serves as a distribution center for other manufacturer's homes. Thus sounds the death knell for private mobile home retailers. *Contrary to common belief, today's manufactured or mobile homes don't all look like 1960s caravans, with the cinder-blocks and wheels. Manufactured homes are prefabricated houses built entirely off site and delivered to where the family has leased land. They can look awfully like real "site built" homes. See for yourself on Clayton's gallery of manufactured and modular homes. The word "mobile" doesn't always to their constantly moving -- although many mobile homes are built on wheels -- but rather their ability to be transported when needed.